After a strange day with clouds in the morning, thunderstorm and pouring rain in the afternoon, and sun but cirrus in the late afternoon and early evening, it cleared during evening twilight. 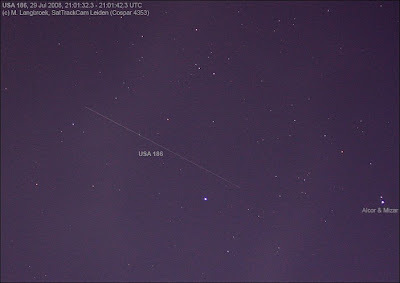 I observed the Keyhole satellite USA 186 (05-042A) make a nice pass. Being invisible to the naked eye first, it made a short bright flare in Bootes and then brightened to mag. +3, being steady after that, crossing into Ursa Major. I got two trail photographs with the EF 50/2.5 Macro, on the last it disappears behind the roof. Hence, 3 points were the result. 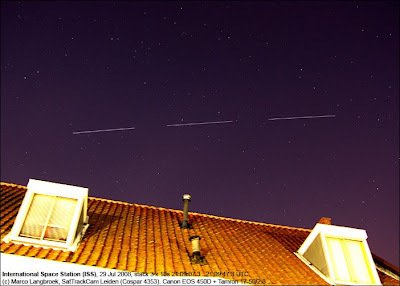 Compared to the 2.5 days old elset 08209.08611721 I have it 1.25 seconds late and 0.12 degrees off cross-track. 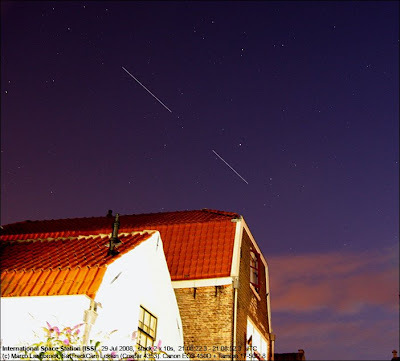 A few minutes later the International Space Station made a fine pass. It was bright, at least -4 when traversing into Aquila. I shot a series of 10s pictures with the Tamron 18-50/2.5 lens at 18mm, and combined them into two stacks.